Iris Arlint won first place in the junior division. Mollie Wintor Sydnor won first in the intermediate category. Left: Iris Arlint won first place in the junior division. Tua Meafua bends a steel rod with his teeth. Charles Lutz and Ethan Kinsey rock the house. 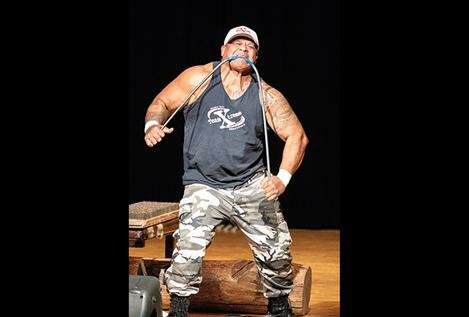 POLSON – Team Xtreme members Tile Falkner and Tua Meafua used brute strength to muscle their way past the competition on Friday evening to win the top spot in the adult division during the 2019 Mission Valley Has Talent competition. Meafua and Falkner wowed the crowd in the Polson High School auditorium with their feats of strength by ripping full-sized phone books in half, bench pressing a 300-pound log on a bed of nails and bending rods of steel in half using only their bare hands – and teeth. 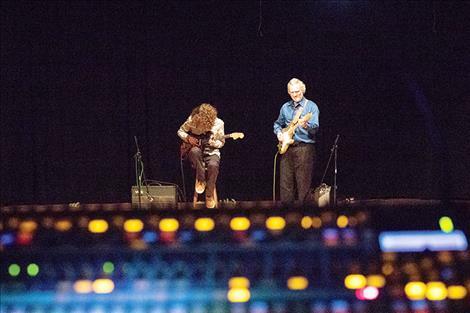 Their act along with fourteen other acts in three different age groups was part of the Mission Valley Ministerial Association’s second annual Mission Valley Has Talent. The show was organized as a showcase for local talent and as a fundraiser for the Helping Hands Fund. Helping Hands is a non-profit ministry that provides emergency assistance to county residents, as well as to those traveling through the area. Helping Hands works with people seeking basic needs such as food, gas and personal care items. The program is growing. Two of the most recent additions to the program include the Baby Box Project, which provides a safe sleeping space for infants, and the Backpack Project, which, in conjunction with the Polson Police Department, provides items to comfort children who are displaced from familiar surroundings. In total, Helping Hands works with more than fifteen agencies throughout Lake County. Last year’s winner, Native American hoop dancer Robert Parot Jr. opened this year’s festivities. “It was really nice to be able to have the chance to perform on the stage tonight,” Parot said. He also acknowledged that he has been afforded a couple opportunities to perform for the public as a direct result of winning last season’s contest. Anderson Broadcasting’s Brian Miskimins emceed the evening. A panel of local judges, which included Dennis Anderson, Nila Anderson, Karen Lewing, Neal Lewing, Chris Bumgarner, Cathy Gillhouse and Margaret Cook, had the arduous task of picking the winners. There were 15 highly entertaining finalists vying for cash prizes of $250, $150 and $100 in three age categories: junior (5 to 12), intermediate (13 to 17) and adult (18 to 95). Iris Arlint accompanied by Ella Arlint on piano set the auditorium ablaze with her rendition of the hit song “This Girl is on Fire.” Arlint walked away with first place and a $250 check in the junior category. Second place in the junior division went to the “Singing Sisters” who were Amelia and Anna Cronk. Pianist Sofia Leighton Pahlen finished third. 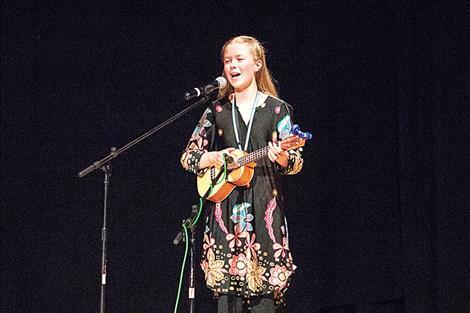 The intermediate division was won by Mollie Wintor Sydnor who mesmerized the crowd with a medley of songs from her ukulele. Following close behind in second was guitarist and vocalist sister act performed by Elizabeth and Abigail DeLay. Tiana and Clair Crist took home third with their piano and violin music. Falkner and Meafua carried away first place in the adult category with their acts of strength, while “Gaelic Thunder” a bagpipes and drumline group rocked the house for second place and humorist Gen Huitt finished third. In addition to the competitors, the audience enjoyed a special performance by local singer, songwriter and guitarist Jordan Albert while the judges tabulated the final results. For more information about Mission Valley Has Talent visit their web page at www.missionvalleyhastalent.org or check out their Facebook page. The Helping Hands Fund may be contacted at 406-883-8256.